1. Wet hands and forearms with warm water. 2. Dispense soap into hands and wash hands and forearms vigorously for at least 20 seconds. 3. Use a clean fingernail brush to scrub under nails and between fingers. 4. Rinse hands and arms with warm water. 5. Dry hands with single-use paper towels and use the paper towel to turn off faucet. 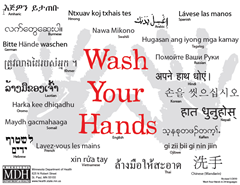 Tip: Post a hand washing sign above all hand sinks in your establishment to remind employees to wash and how to wash! Poster can be found on the Minnesota Department of Health's website. Hennepin County Public Health Department is thrilled to welcome Mandi Mallet! Before joining Hennepin County’s Public Health Department full-time in March of 2016, Mandi worked part-time as an environmental health specialist for Hennepin County, and part-time as an environmental health specialist for the City of Minnetonka. Mandi’s primary duties for Hennepin County include food, pool and lodging inspections. Mandi graduated with a Bachelor of Science in Environmental Science, with an Environmental Health Concentration from the University of Wisconsin-Stout, in December of 2014. She was part of the very first graduating class from UW-Stout’s Environmental Health Program. Mandi is currently a board member for the UW-Stout Environmental Science Advisory Board, which aims to continually improve the program and ensure all graduates are prepared for success after graduation. In her spare time, Mandi enjoys traveling and spending time with her family and friends. Summer is an exciting time in Hennepin County and it is right around the corner. Festivals, fairs, sports tournaments, and other short-term events quickly fill Minnesota’s short summer season. Hennepin County Environmental Health is excited about some changes that have been made to help increase food safety and education for short-term food vendors. Our updated Short-term Food Event License application contains two helpful documents that vendors are required to review, implement, and keep on-site for the duration of an event. A self-inspection checklist has been added to the application to help vendors prepare for a visit from the health inspector. This checklist must be completed as the stand is set up, prior to serving food at an event. A guidelines document has also been created. It should be used as a quick reference and must be reviewed by everyone handling food at an event. Food safety steps must be followed in accordance with the Minnesota Food Code to ensure that the risk of foodborne illness is reduced. Being prepared will ensure safe food for your customers and result in a successful event. If you or your establishment cooks or prepares food outside the walls of your establishment, it is important to know that additional licensing may be required. For an application and additional helpful documents, visit our website www.hennepin.us/itinerant. You can also call our office at (612) 543-5200. We are happy to answer your questions. More information can be found at the Minnesota Department of Health’s website). 1. Food employees shall wash their hands as specified in part 4626.0070. 3. Food employees shall minimize bare hand and arm contact with food that is not in a ready-to-eat form. As the weather gets warmer, remember to keep all doors and windows closed in the food facility when not in use (e.g., receiving doors, front door, drive through window, windows without screens) to prevent insects and rodents from entering. This is a requirement from the Minnesota Food Code section 4626.1395.